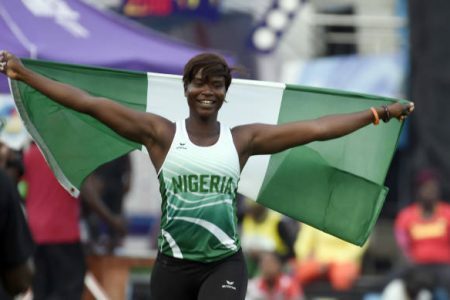 Team Nigeria took its medal haul to 14 on Day 4 (Saturday) of the ongoing CAA African Senior Athletics Championship at the Stephen Keshi Stadium in Asaba, Delta State with podium finishes for Nwanaga Kelechi and Abejoye Oyeniyi. Kelechi gave Nigeria a fifth gold medal my winning the women’s Javelin final with a throw of 56.96m ahead of South African athlete Jo-Ane Van Dyk (won silver with 53.72m) and Josephine LaLaw of Uganda (won bronze with a throw of 51.33m). In the 110m hurdles, Abejoye Oyeniyi clinched silver with a time of 13.87s. Antonio Alkana of South Africa won the race to take gold with a time of 13.51s , while Wellington Zaza of Liberia took the bronze medal in 13.88s.